Our SMA, 2.4mm, 2.92mm and 7/16 DIN DC blocks are available in frequency ranges up to 50 GHz, in accordance with the performace limits of the specific connector. With block types of inner only, outer only and combined inner / outer, we can provide a DC block suitable for almost any requirement. 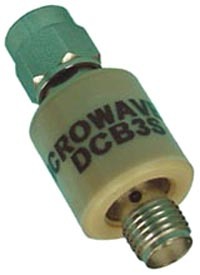 Additional connector types are offered with either 50 or 75 Ohm characteristic impedance, in frequency ranges appropriate for the connector. Consult factory for between-series units and connector configurations not listed. Consult factory regarding availability of block types and connector configurations not listed.